Looking at who was around Da Nang around then, he must be part of 1/3 or 1/9 Marine Corp. This soldier just arrived. That’s why he is still wearing a white t-shirt and is wearing clean fatigues and has a new looking web belt. Some of the soldiers on Vietnam were too young to legally buy alcohol. Picture found in a book called “The Marines in Vietnam 1965” with the following description: The Landing and the Buildup, Operation Blastout 1. In the Chronology of Significant Events section it says that on 3 August 1965 (the date of the photo) Company D, 1/9 had conducted a one day operation (Operation Blastout 1) at Cam Ne, south of Da Nang. Situated on flat, sandy ground on the south side of the major port city of Da Nang, the area was ideal for an airfield, having unobstructed approaches to its north/south runways. The base became a joint operating airfield when U.S. Forces came to the aid of the South Vietnamese. The combat unit who landed on Da Nang to protect the airbase was the first U.S. ground unit to land on South Vietnam. In Vietnam, the soldiers did not feel the work they were doing there in saving the Vietnamese was being acknowledged by the people they were doing it for. That was a reason for the rage that built up within a majority of the soldiers. Soldiers also had to face a very harsh weather, totally unlike what it is in the US. Their life was divided into long intervals of having to do nothing but fend against the weather and the rough environment and short unpredictable intervals of actual battle with the enemy. During the early years of the war, many American servicemen supported the U.S. government’s decision to become involved in Vietnam. They believed it was important to stop the spread of communism in Southeast Asia. As a result, the morale of American troops was fairly high—at first. By the late 1960s and early 1970s, however, both the morale and performance of the U.S. forces declined rapidly. 58,148 were killed in Vietnam. Of those killed, 61% were younger than 21, in total 11,465 were younger than 20 years old. At the end of the war the average age of men killed was 23.1 years. how can I find out who this soldier is and if he has made it home alive? Is that his name on his pocket? Is that a pistol holster on the belt he his holding? I didn't think privates were issued pistols. Pistols could be issued to enlisted personnel depending on their MOS (job). He might be a mortar crewman, grenadier, machine-gunner, or any number of other positions that would have authorized a .45 as a sidearm. And for those who wondered, according to military sources, there is no KIA listed having the first initials "R.C" with the last name starting with "Cog-"; so apparently he did survive his tour. 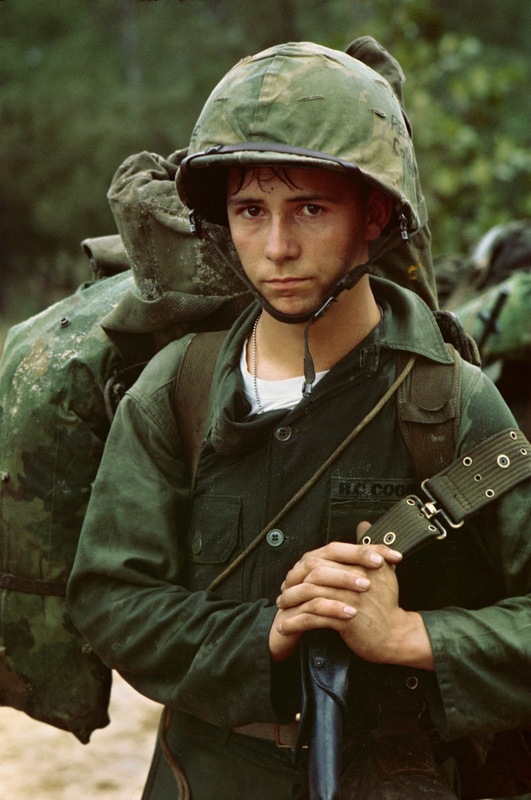 I've seen this photo of the young soldier in Vietnam and wished I knew who he was. It haunts me to see how young he is and what was in store for him in that war. I was in the military during the Vietnam war too, but I didn't go to Vietnam, and it makes me feel guilty every time I look at that photo. I hope he made it home after his tour of duty. Me too. I'd really like to know who he is (his name tab look's something like 'Cogan'..maybe) When I first saw this photo it took my breath away-he looks barely out of boyhood, and I would very much like to know if he made it through Vietnam. If his age was say eighteen years in 1965 then he would be around sixty nine years today. Possibly long passed away. Still be interesting to find his name and history. The comment about the harsh weather being totally different to the US, in what way? I'd say that the humid places like louisiana, arid states like nevada or the freezing winters in alaska are just as harsh. Also not being appreciated by the local people, maybe the locals didn't appreciate a force of armed foreigners in their area? Talking about humid conditions. I have lived in Arkansas and worked there for several years. In one word I can explain it as "extreme." I worked in the ice and in the extreme heat. Right now at this moment I live in the Philippines. Yes it is humid. Very humid but it isn't nothing like the weather in the USA. I have lived in the deserts (Texas) and in the arctic (Alaska) and I have to say that this is one of the easiest places to live in the Philippines. I am not trying to say it isn't bad. I am trying to convey that the USA has about some of the harshest conditions of all the world depending on where you live. "The major wars the United States has fought since the surrender of Japan in 1945 — in Korea, Indochina, Iraq and Afghanistan — have produced colossal carnage. For most of them, we do not have an accurate sense of how many people died, but a conservative estimate is at least 6 million civilians and soldiers." And we don't count the death toll in Latin America and Africa.And the death toll in Indochina after they left due to cancer ,mines and so on. And they always wonder about the anti-Americanism feelings of so many people.